The journey from the gross to the subtle body. "When someone asks me what is so special about Yin Yoga, I answer: it is the journey from the gross to the subtle body, that we can experience during our yoga practice and the insight that results from it. The magic and the healing unfold during the Rebound." - M.G. Experience and enjoy the journey inwards in this intensive Yin Yoga Masterclass. We will stimulate the internal energy through our mind, breath, resonance and our body. During the Rebound effect we will sense the gentle to strong electrical stimulation of the chakra and meridian systems and the resulting powerful effect on the physical, emotional, energetic and mental levels. An experience that you will not forget. Why Are You Here is posed at the beginning of class to lend more depth and purpose to your yoga practice. Why Are You Here awakens consciousness, urging you to respond. But what is the underlying purpose of our yoga practice and our lives? Why are we here? In an initial lecture, we delineate the yogic view of the question why we are here and explain what our purpose in this life could be! A deeply personal and intense experience! We will conclude the afternoon session with a Yin Yoga asana practice guiding, and integrating the charged mental energy throughout our bodies. Yin Yoga has a mental, emotional, energetic and physical effect. Following this very personal and intensive mediation/contemplation, we can expect response in all areas of our lives. This asana practice can be challenging on all levels! Are you ready to encounter your true self? Many of us are not only afraid of dying! Many of us detest ourselves throughout life and criticise for example, our own bodies (too big, too thin, too tall, too small) covering up our deep-seated fears of being criticised, ridiculed or not being good enough. A deep-seated feeling within us says "you are not (good) enough". It appears that we simply have no idea how to live a happy life. Instead of experiencing the miracle of life - our existence as part of nature, we distract ourselves from it and deal with life the best we can. At the end of life, most of us are full of regret. In this Yin Yoga session, we explore the art of living through the six senses with which we perceive life! We will discuss how to overcome our ignorance of the Queens and Kings (ourselves), how to deal with fear, frustration and anger and how to nourish one’s happiness through mindfulness. We introduce a powerful tool, a sound which brings us back to the here and now - to live life in the present and without regrets in the future. Experience and enjoy the journey inwards. We will stimulate the energy of your body through the mind, the breath, the voice (vibration) and with the body. In the rebound, we will experience the gentle, undulating to the strong and powerful electrical stimulation of the chakra and meridian systems, which has a powerful effect on the physical, emotional, energetic and mental planes. A potent experience that you will not easily forget. in Yoga - Why Are You Here? 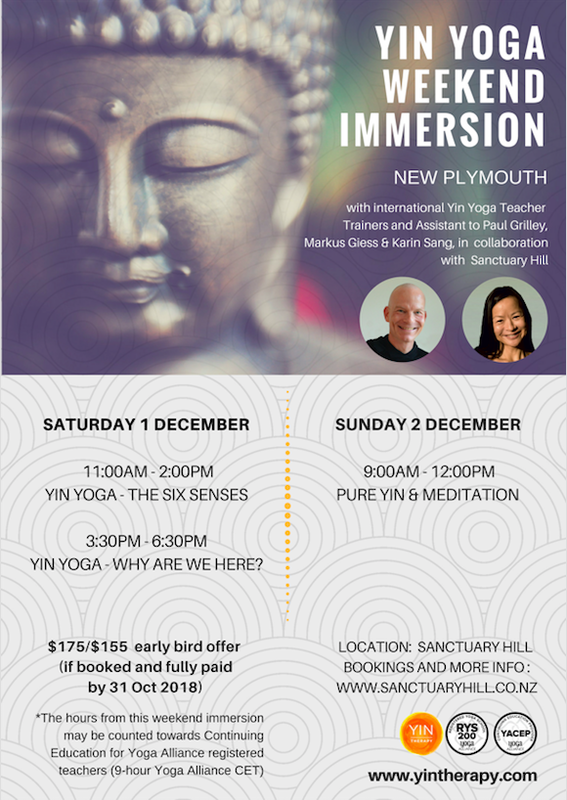 We will conclude the immersion with a deep 3 hour practical Yin Yoga asana & meditation practice, integrating the philosophical aspects from the previous day’s sessions. The hours from this weekend immersion can be used towards Continuing Education with Yoga Alliance for registered teachers. 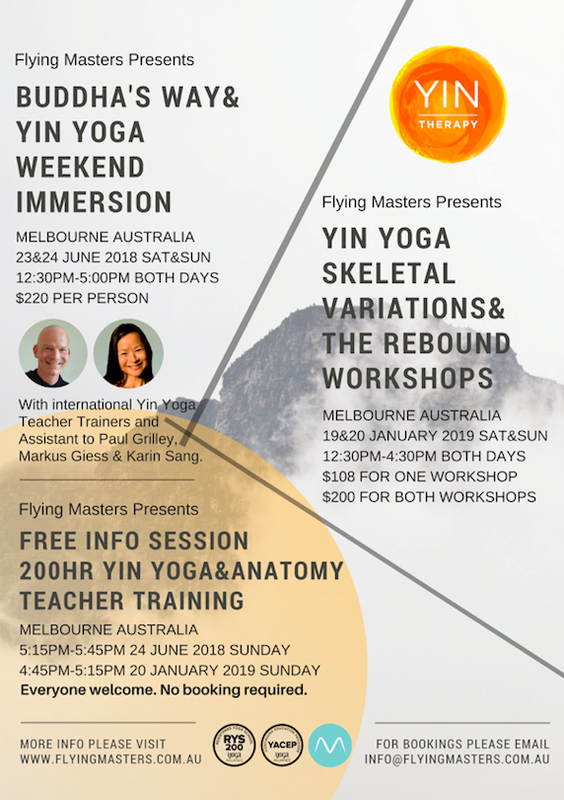 Free info talk for yoga students and teachers alike, who are interested to find out more about Yin Therapy's 200hr Yoga & Anatomy Teacher Training (internationally recognised by Yoga Alliance). We will explain the outline of the training with time for discussion and an opportunity to answer any questions that may arise regarding the training. For all levels from beginners to experienced yoga practitioners and yoga teachers. Learning the reality from a different perspective and in doing so, reducing stress. Learning to focus one's awareness and and perception for what it really is. Learning to know one's mind through thought, emotion, reaction. This weekend promises be a deeply personal journey within. • How does the mind function? • How does the mind cause dis-ease? • How does stress arise? • What happens in the body under stress? • The Interrupter – The Observer – Who observes? • Practical meditation exercises for one's individual practice and to pass on to one's students! The guided yin yoga classes will be taught with the focus on the more meditative, spiritual and energetic aspects of yin yoga in keeping with Buddha's meditation und Buddha's Way. This workshop is suitable for yoga teachers and also yoga students wishing to learn more about yin yoga and yoga anatomy. Our workshop will begin with a lecture explaining the physical practice of yin yoga and the positive affects of the practice on stress and back pain. Understanding individual bone structure means avoiding injuries! In the second hour, our focus will shift to the anatomy of yoga. Following international yoga teacher (and fellow Paul Grilley student) Bernie Clark’s long awaited and hotly discussed book release in 2016 “Your Body, Your Yoga”, yoga students and teachers around the world are recognising the limitations (and potential harm) of the “one alignment for all” rule book. The quintessence of the book: "There is no classical alignment, only individual alignment." Leslie Kaminoff, international yoga anatomy teacher and fellow ambassador for individual alignment says "Asanas have no alignment. People have alignment. There is no correct universal alignment!" In the second half of the workshop, we will offer a yin yoga asana class for the back to experience the deep affects of the profound practice. No booking required. Just come on by to Studio Evolve! Both workshops are suitable for yoga teachers and also yoga students wishing to learn more about yin yoga and yoga anatomy. Where are the areas of compression and tension within my individual bone structure? How do I deal with it? How can I stretch and stimulate the tissues, when compression is constricting me? These workshop hours can be used towards Continuing Education with Yoga Alliance for registered teachers. Depending on the length of the workshop, either all or only a selection of Yin Yoga and Anatomy listed below will be practised. In this 4hr intensive workshop, we will learn about individual bone structure, discover just how different our bone structures really are and how this has great significance in regards to the question of yoga alignment. When we understand the importance of respecting our individual bone structure, we realise the shortfall of classic alignment rules and the importance of finding our own individual alignment and consequently we will discover our own very individual and unique yoga asana practice – maximising the benefits and minimising the risk of injury. We will conclude the workshop by taking our new knowledge on to the mat with a profound and deeply relaxing yin yoga class. Individual alignment is relevant for all styles of yoga asana, but with a yin yoga class we have the benefit of time while marinating in one pose, to explore our bones, our joints, our bodies to feel where they naturally want to align. We will discover that by respecting the individual alignment of our individual bodies, our yoga asana practice will become liberated. This workshop is suitable for yoga teachers and also yoga students wishing to learn more about yin yoga and yoga anatomy (à la Paul Grilley). Skeletal variation tests and practical consequences for yang yoga asanas and assists. 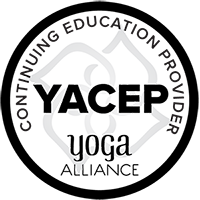 For more detailed information regarding the workshop syllabus, venue, booking information please click here. This workshop is suitable for yoga teachers and also yoga students wishing to experience and learn more about Yin Yoga and yoga anatomy. We will take you on a journey to “the other half” of yoga based on the teachings of their Yin Yoga teacher and mentor, Paul Grilley. All workshops are suitable for yoga teachers and also yoga students wishing to learn more about Yin Yoga. We will reveal in a one-hour lecture, the unique therapeutic qualities and benefits of Yin Yoga and you will discover why Yin Yoga is considered to be a vital complementary practice for not only yoga teachers/practitioners and sports people but for anyone and everyone, especially those suffering from chronic back pain or stress related illnesses. Both yin and yang forms of exercise are necessary for wellbeing. They belong together intrinsically, creating harmony between body, mind and soul. We will continue where we left off from the first session, with a further short lecture delving further into what makes Yin Yoga such a powerful practice. Lower back pain is the most prevalent of musculoskeletal conditions and its impact is pervasive. It affects hundreds of millions of people around the world. 80% of adults experience back pain at least once a year. It is the most common cause of job-related disability and a leading contributor to missed work days. In this 4 ½ hour Yin Yoga intensive masterclass – The Anatomy of Back Pain, we will examine lower back pain – from a physiological and psychological perspective. You will learn about fascia – the “yin” tissue - the integral role it plays in the lower back, the importance of fascial fitness for maintaining a mobile and pain free body and why Yin Yoga is considered to be a highly effective, therapeutic method to help relieve and/or cure back pain. The “backbone” of Yin Yoga is yoga anatomy from a functional perspective. You will learn about skeletal variation, the limitations of alignment and the importance of recognising your own unique bone structure and subsequently discovering your own unique yoga asana practice. You will then experience a deeply relaxing Yin Yoga class for the back. You will be guided within, to listen to your body and learn how to modify the asanas to respect your individual bone structure. You will come away from this masterclass with a new appreciation and understanding for the wonder that is your back. This masterclass is suitable for teachers and students alike, who want to discover how a little Yin Yoga Love can go a long way to healing back pain forever. This workshop is suitable for yoga teachers as well as yoga students. "It's all in the bones"
Both workshops are suitable for yoga teachers and also yoga students wishing to learn more about yin yoga and yoga anatomy (à la Paul Grilley).